Transposition changes the rules for refactoring legacy business applications to the latest environments. Leveraging patented technology breakthroughs, Gizmox offers an end to end tool-based best of two worlds approach: the automation of migration and the flexibility of rewrite. 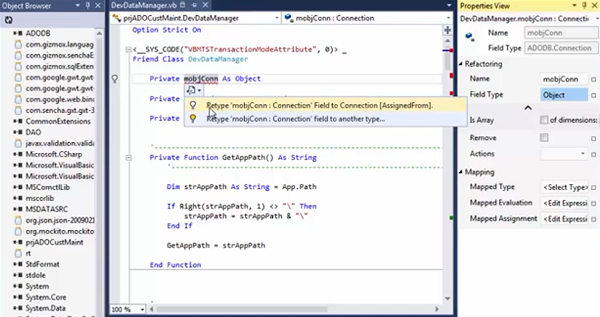 Transposition Studio - For refactoring: VB6, classic ASP, VB.NET, ASP.NET, XP supported applications To: ASP.NET MVC, C#, VB.NET HTML5 web, Windows 8, Cloud and Mobile applications. Assessment Wizard - Self-use, free downloadable wizard which analyzes legacy application in its original environment. The Wizard analyses the source application and its environment and reports gaps and transposition plan to target environment and application. The tool-based process starts with automated parsing of the source code. It translates the code into “raw code” – intermediate code for the tool to work on. The iterative process includes automatic (existing rules) and customizable refactoring (new rules). 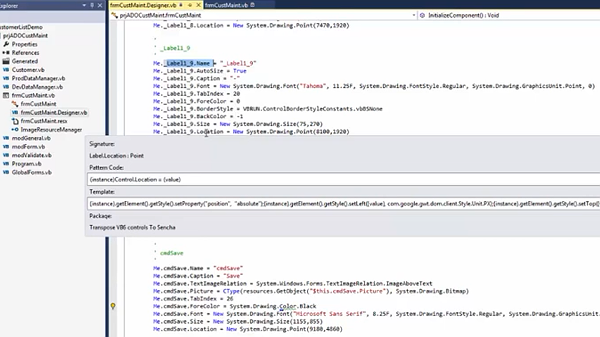 Refactoring rules are applied for retyping, renaming, removing of objects, members, parameters etc. Continuous compilation checks the integrity of the resulting code throughout the refactoring phase. Any definable module, including code segments and components, is map-able and replaceable by new target environment code patterns and components. All mapping actions are defined by rules. The mapping integrity is also continuously tested by the virtual compilation. The described set of tools enables complete application reengineering. On top of those tools, application structure can be redefined by a feature called “behaviors” which enables for example splitting code into client and server components. This powerful feature enables the complete re-architecting of the application. At any given stage in the process the tool offers a set of additional visual tools to investigate and debug the code and application structure. These features offer deep level visibility and they guide the user throughout the debugging process. The process is iterative, so code generation and target application builds are done iteratively throughout the process. The first target is complete compilation with no errors out of the tool. Once this stage is achieved the new application is ready for QA phase. 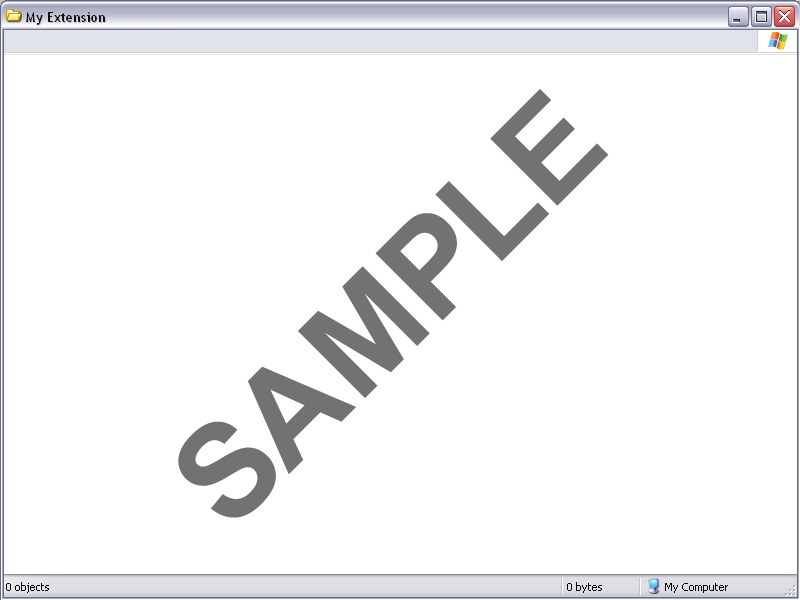 Analyzes the source application in its original environment at the AST level (based on compiled code). It uses a subset of the analysis features of Gizmox Transposition, to analyze source to target gaps. 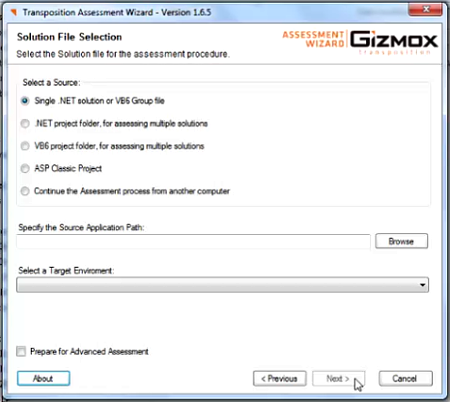 With advance mode the assessment wizard takes a snapshot of the source application code and its environment. It serves for a deeper analysis or for a Demo or POC. Demonstrates feasibility and the unique abilities of the Transposition tool. Usually performed on a module of the application. All Transposition projects start by running the Assessment Wizard and consulting with our Transposition experts. Transposition changes the rules for refactoring legacy business applications to the latest environments. Leveraging patented technology breakthroughs, Gizmox offers an end to end tool-based best of two worlds approach: the automation of migration and the flexibility of rewrite. Transposition analyzes your existing application and the gaps to target environment. Based on this analysis, Transposition refactors code, migrates logic, and translates the code’s language. Transposition also replaces legacy components with new ones and re-architects the application structure to the new platform. When the code is reassembled for the new environment, the result is a new application which can be maintained and extended as any newly written application written for the web, mobile or cloud.